Page added in August 2014. For a long time the octagonal building surrounded by a portico and having its entrance in the Peristyle was believed to be a temple to Jupiter. 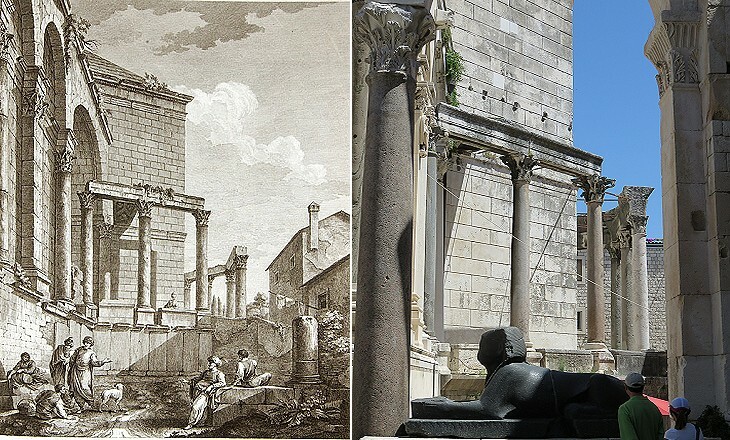 Today it is believed to be the mausoleum of Emperor Diocletian and the Temple to Jupiter has been identified in another temple on the other side of the Peristyle. The mausoleum was turned into a church and in the XVIIth century a small rectangular apse was added at its back. The aspects of this monument related to its being the Cathedral of Spalato are dealt with in a separate page. One thing which makes the exact identification of the buildings difficult is the lack of inscriptions and statues. 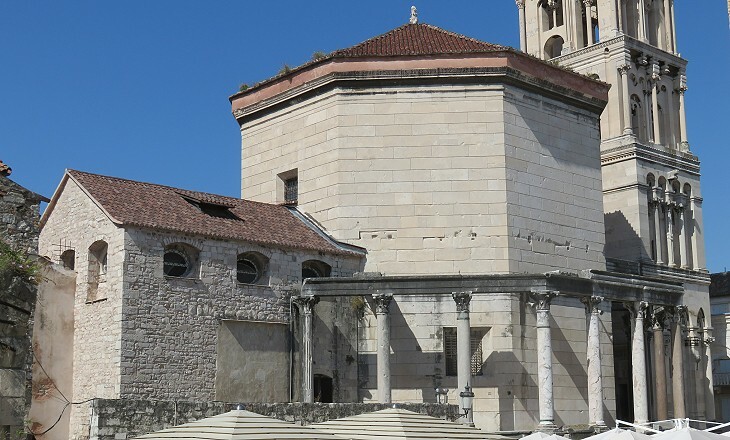 Considering that it is very unusual to find a Roman monument without a dedication or a plaque with the names of those who built it, the absence of inscriptions at Diocletian's palace could be explained by its use as a private residence. 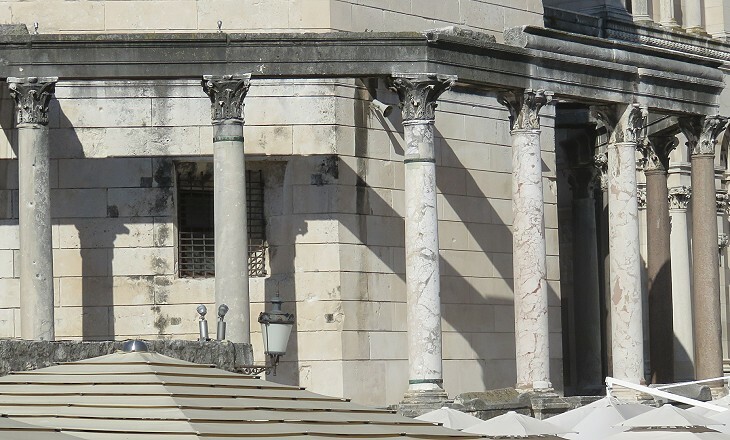 It is likely that statues were placed on the portico surrounding the mausoleum which could have provided an indication about the purpose of the building, but they have not been found, even broken. While Diocletian, that author of ill, and deviser of misery, was ruining all things, he could not withhold his insults, not even against God. (..) It was peculiar to him, that whenever he saw a field remarkably well cultivated, or a house of uncommon elegance, a false accusation and a capital punishment were straightway prepared against the proprietor; so that it seemed as if Diocletian could not be guilty of rapine without also shedding blood. Diocletian persecuted the Christians in 303-305 and he was regarded by them as one of the worst emperors. The statues of the mausoleum were most likely destroyed after 393 when Emperor Theodosius declared Christianity to be the state religion. 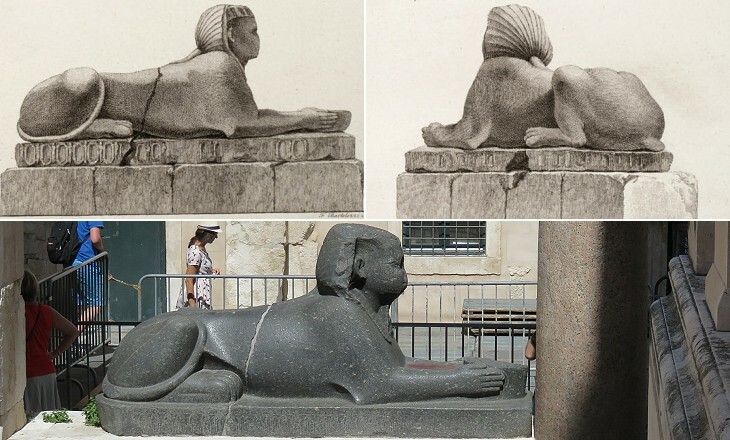 Only three statues portraying sphinxes escaped destruction because they were made of basalt or granite, hard stones which were difficult to work and, unlike white marble, could not undergo calcination in order to produce quicklime. Their hieroglyphs indicate they came from an Egyptian temple built by Pharaoh Thutmose III (XVth century BC). The fine and picturesque views by which Adam illustrated his book were based on sketches by Charles-Louis Clérissau, a French painter who accompanied him to Spalato. In 1882-85 the Austrian government promoted a major restoration of the mausoleum/cathedral and in that circumstance the access to it was renovated and the portal was completed by adding its missing parts. Adam hired two Italian draughtsmen to accompany him to Spalato and make detailed drawings of the decorations of the ancient monuments. 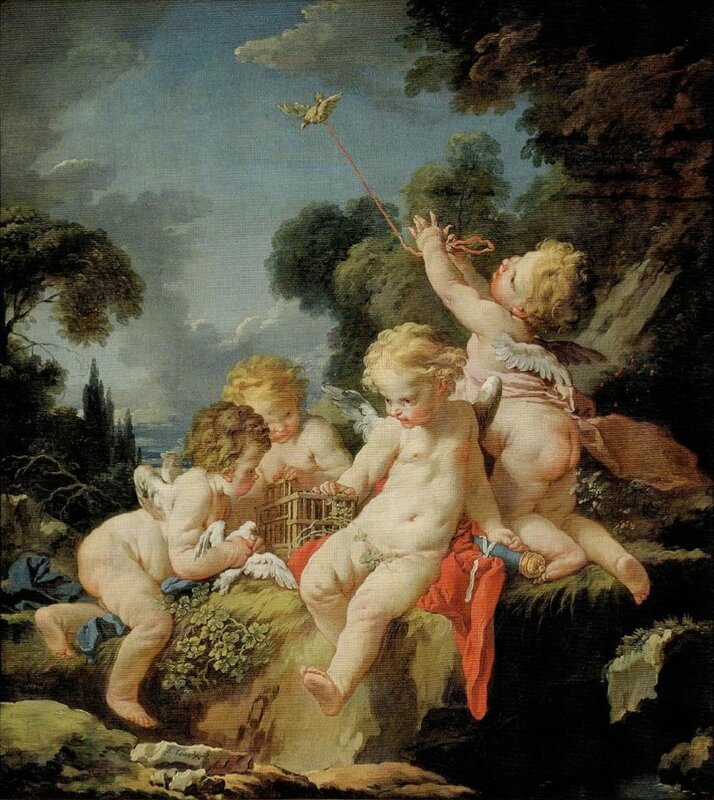 The detail shown above was almost entirely missing in 1757 when Adam visited Spalato. 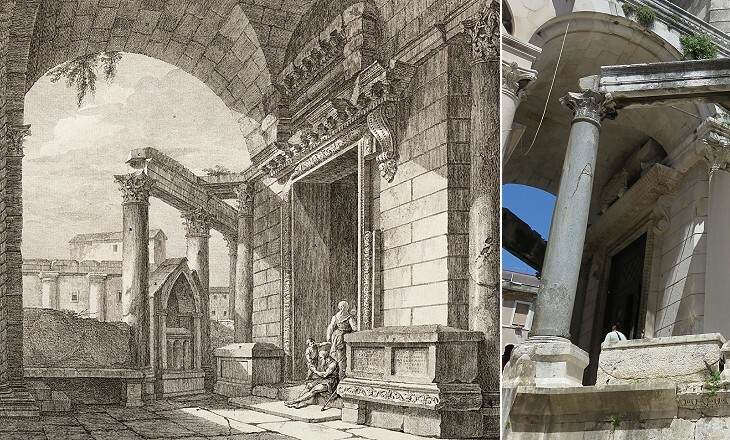 Eventually the drawing was used by the Austrian restorers in their (perhaps excessive) reconstruction of the portal. 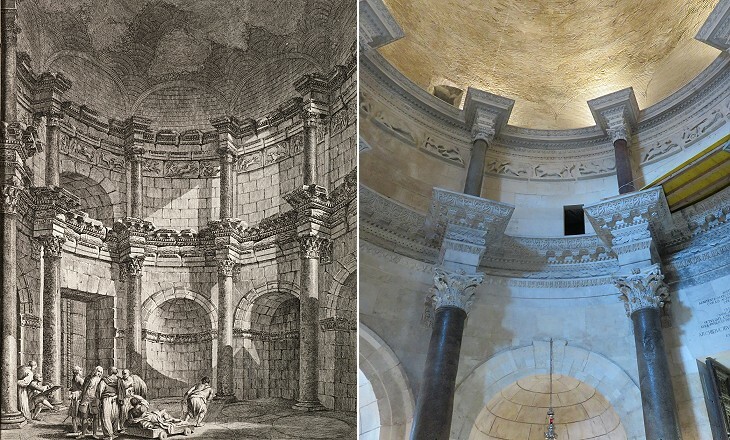 The mausoleum has an octagonal shape, but its interior is circular and the ceiling is a dome, rather than a pyramid. 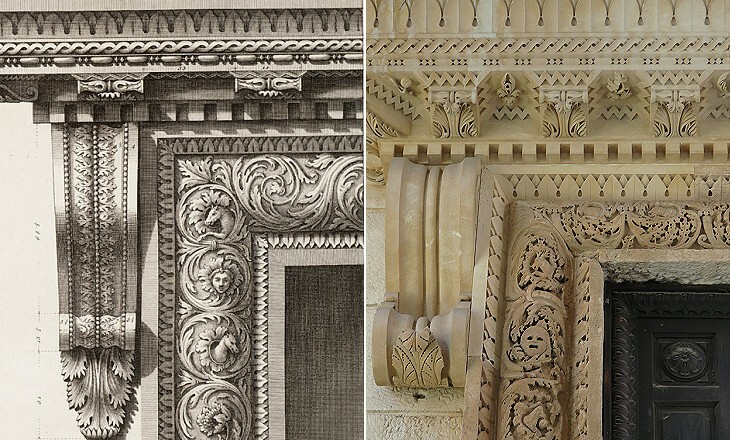 The Austrian restorers removed all the ancient capitals and replaced them with new ones. 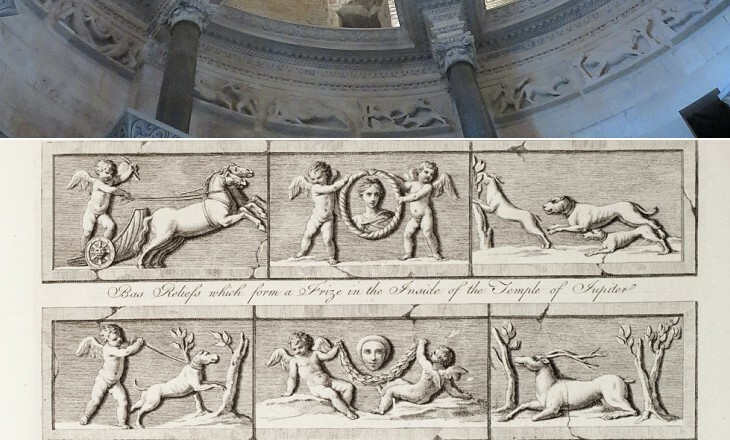 The frieze of the upper storey was very worn out in 1757 and the restorers could not do much to improve its visibility so it is better to view some of its reliefs in Adam's etchings (see below). They do not seem particularly appropriate for a mausoleum. This supports the opinion that initially the building was not meant to be a tomb. This page ends the coverage of Diocletian's palace. The emperor wanted to be treated as an absolute monarch of the XVIIth century, but he was not a megalomaniac as King Louis XIV of France was. His palace, unlike Versailles, did not cost a fortune.